I used wild caught Pacific salmon for this salad. I love the deep red color of the raw salmon, and the gorgeous bright pink when it's cooked. It's also incredibly flavorful. You actually cook the salmon for this salad in a microwave, which makes the recipe so easy. The potatoes only take about 10 minutes to cook, and I got to use the indestructible and neglected chives that grow in a tiny pot on our back wall. 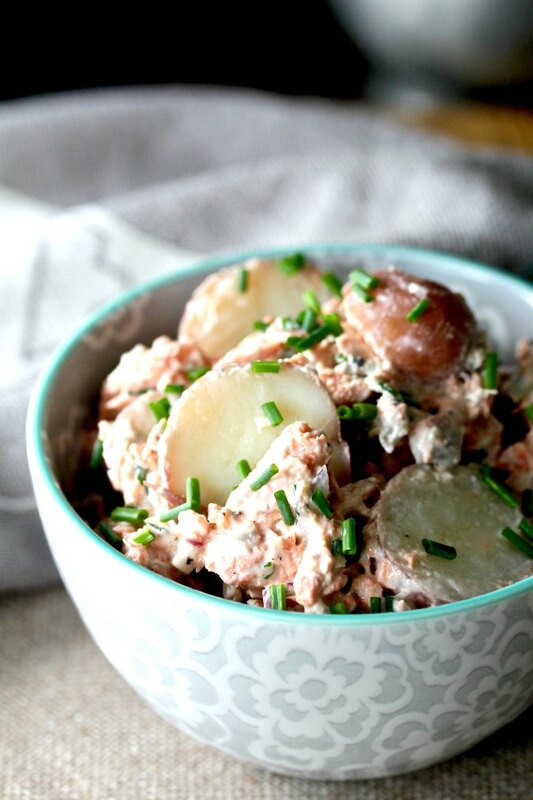 This salmon and potato salad was delicious. I would have never tried it if I hadn't joined Wendy's group, Fish Friday Foodies. The theme for this month is fish salads, chosen by Sid of Sid's Sea Palm Cooking, and I wanted to make a fish salad that didn't involve shellfish, as much as I love it. I just wanted to try flexing some new "fish salad" muscles. After the recipe, you will find more links to delicious salads with fish. P.S. 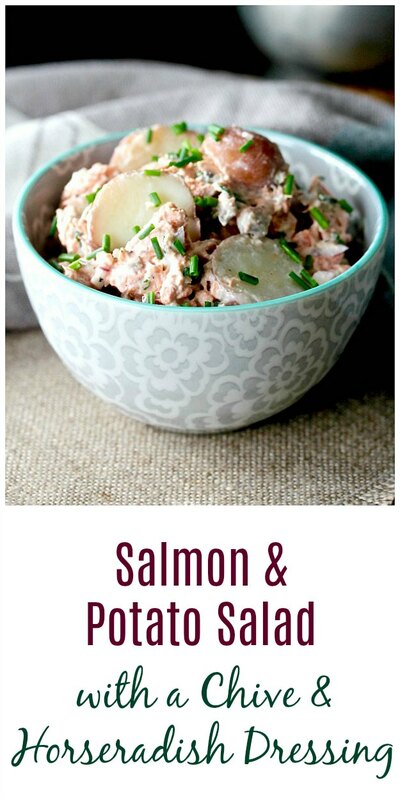 For an extra Scandinavian touch, you can also make this salad with half steamed salmon, and half smoked salmon. In a medium saucepan, cover the potatoes with water, and add 1 teaspoon of salt. Bring to a boil, reduce to a simmer, and cook for about 10 minutes, until the potatoes are tender. Drain the potatoes and set aside to cool. Place the salmon on a microwave safe plate and season with salt and pepper. Microwave, skin side up, for 5 to 7 minutes, until the fish is fully cooked and flakes with a fork. Remove the skin and discard. Let the salmon cool slightly in a medium bowl. Using two forks, roughly break the salmon into pieces. Add the potatoes to the salmon. 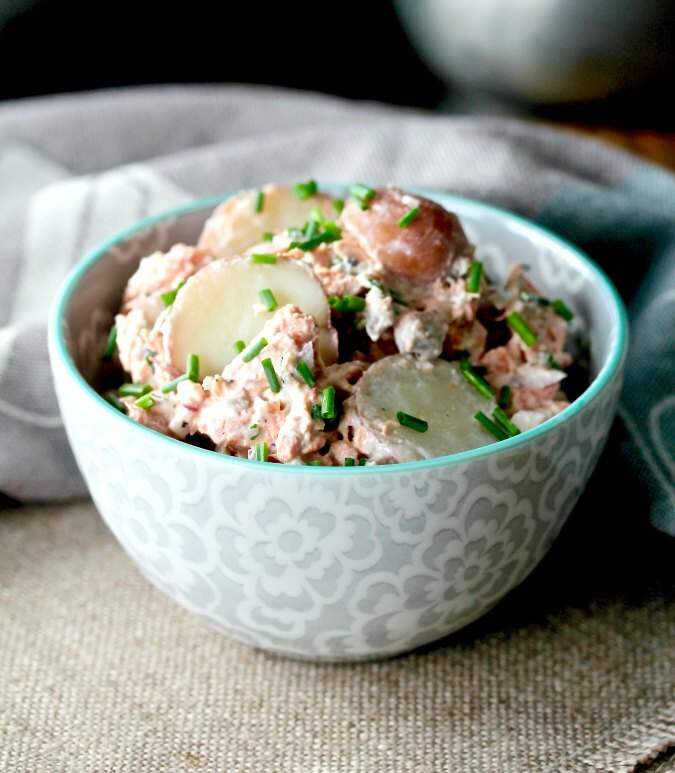 In a small bowl, whisk together the onion, sour cream, mayonnaise, chives, lemon juice, and horseradish, and toss it with the salmon potato mixture. Add salt and pepper to taste. I think the horseradish dressing sounds amazing for this salad Karen. What a lovely salad for a picnic or potluck, Karen. I love wild salmon and I can just taste it with that gorgeous creamy dressing! Thanks Stacy. I was so happy with this recipe! I think I have everything I need to make this! Yum. Soon. Thanks for the inspiration, Karen. Must try this salad, when I get hold of horseradish.